Cognitive Contributions to the Perception of Spatial and Temporal Events: Editors' Introduction. Cognitive Contributions to the Perception of Spatial Events a) Action-Oriented Views. Separate Representations of Visual Space for Perception and Visually Guided Behavior (B. Bridgeman). The new dissociationism: implications for action. Commentary on Bridgeman (P. Haggard). On the Perception of Position (A.H.C. Van der Heijden et al.). Function and processing of "meaningless" and "meaningful" position. Commentary on Van der Heijden et al. (P. Wolff). Space Perception and Intended Action (P. Wolff). The limits of an occasionalist Gibsonian theory of perceptual space. Commentary on Wolff (H. Hecht). Cognition and Spatial Perception: Production of Output or Control of Input? (J. Scott Jordan). Efference copy and intention: old wine in new bottles? Commentary on Jordan (B. Bridgeman). Motor Determinants of a Unified World Perception (J. Paillard). A motor theory again? Commentary of Paillard (A.H.C. Van der Heijden). Can we explain cross-modal representation with neural algorithms alone? Commentary on Paillard (M.A. Elliott). How Independent from Action Control is Perception? An Event-Coding Account for More Equally-Ranked Crosstalks (J. Müsseler). Induction and impairment during event control: a means of resolving the perception-action distinction? Commentary on Müsseler (J. Scott Jordan). Cognitive Contributions to the Perception of Spatial Events b) Attention-Oriented Views. Effects of Attention on Length Perception, Gap Detection and Visual Localization. Towards a Theory of Attentional Receptive Fields (Yehoshua Tsal). About neural implementation and microgenesis. Commentary on Tsal (T. Bachmann). Twelve Spatiotemporal Phenomena and One Explanation (T. Bachmann). Pertentional retouch, selective attention and synchronicity priming. Commentary on Bachmann (H.J. Müller, M.A. Elliott). Cognitive Contributions to the Perception of Temporal Events. Perceived Timing of Self-Initiated Actions (P. Haggard). Mental chronometry and the timing of "high level" conscious intentions. Commentary on Haggard (D. Zakay). Action Timing in an Isochronous Tapping Task. Evidence from Behavioral Studies and Neuroimaging (K. Müller et al.). The negative asynchrony phenomenon: a prospective timing perspective. Commentary on Müller et al. (D. Zakay, R.A. Block). What is the source of the mean anticipatory synchronization error during temporal tracking? Commentary on Müller et al. (D. O'Boyle). Reaction Time and Temporal-Order Judgment as Measures of Perceptual Latency: The Problem of Dissociations (P. Ja&sacute;kowski). Reaction time and temporal order judgment: two measures of perceptual latency? Commentary on Ja&sacute;kowski (C. Steglich). Characterising perceptual latency. Commentary on Ja&sacute;kowski (D. O'Boyle). Task-Dependent Timing of Perceptual Events (G. Aschersleben). Some remaining problems on temporal dissociations. Commentary on Aschersleben (P. Ja&sacute;kowski). 40-Hz-Synchronicity Priming of Kanizsa-Figure Detection Demonstrated by a Novel Psychophysical Paradigm (H.J. Müller, M.A. Elliott). Is 40 Hz synchronicity priming shown by a novel psychophysical paradigm indeed a 40 Hz phenomenon? Commentary on Müller & Elliott (K. Müller). Cognitive Contributions to the Perception of Intermodal Events. Ventriloquism: A Case of Crossmodal Perceptual Grouping (P. Bertelson). The advantages and limitations of the psychophysical staircases procedure in the study of intersensory bias. Commentary on Bertelson (R.B. Welch). Meaning, Attention, and the "Unity Assumption" in the Intersensory Bias of Spatial and Temporal Perceptions (R.B. Welch). Ventriloquism and the nature of the unity decision. Commentary on Welch (J. Vroomen). The Development of Temporal and Spatial Intermodal Perception (D.J. Lewkowicz). On the asymmetry of the temporal contiguity window. Commentary on Lewkowicz (G. Aschersleben). Seeing Cries and Hearing Smiles: Crossmodal Perception of Emotional Expressions (B. de Gelder et al.). Crossmodal perception and the function of emotion. Commentary on de Gelder et al. (H. Hecht). Author index. Subject index. The book is concerned with the cognitive contributions to perception, that is, with the influence of attention, intention, or motor processes on performances in spatial and temporal tasks. The chapters deal with fundamental perceptual processes resulting from the simple localization of an object in space or from the temporal determination of an event within a series of events. 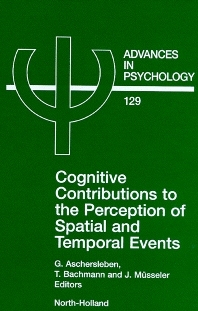 Chapters are based on presentations given at the Symposium on the Cognitive Contributions to the Perception of Spatial and Temporal Events (September 7–9, 1998, Ohlstadt, Germany). Following each chapter are commentary pieces from other researchers in the field. At the meeting, contributors were encouraged to discuss their theoretical positions along with presenting empirical results and the book's commentary sections help to preserve the spirit and controversies of the symposium. The general topic of the book is split into three parts. Two sections are devoted to the perception of unimodal spatial and temporal events; and are accompanied by a third part on spatio-temporal processes in the domain of intermodal integration. The themes of the book are highly topical. There is a growing interest in studies both with healthy persons and with patients that focus on localization errors and dissociations in localizations resulting from different tasks. These errors lead to new concepts of how visual space is represented. Such deviations are not only observed in the spatial domain but in the temporal domain as well. Typical examples are errors in duration judgments or synchronization errors in tapping tasks. In addition, several studies indicate the influence of attention on both the timing and on the localization of dynamic events. Another intriguing question originates from well-known interactions between intermodal events, namely, whether these events are based on a single representation or whether different representations interact. For researchers in psychology and cognitive science with an interest in perception and time. Glsa Aschersleben worked as research and teaching assistant from 1987 to 1991 at the Psychological Institute of the Technical University in Munich, her main research interests then being man-computer interaction and software ergonomics. Since 1991 she has been a senior researcher at the Department for Cognition and Action at the Max Planck Institute for Psychological Research in Munich. In 1993 she completed her thesis in psychology on Afferent Information Processing and the Synchronization of Events. Her habilitation was on Task Dependent Timing of Perceptual Events (1998). At present her main research interests are: temporal control of actions, cognitive representations of actions, perception-action, coupling, attention, intersensory integration. Max Planck Institute for Psychological Research, Leopoldstrasse 24, 80802 Munich, Germany. Department of Psychology, University of Portsmouth, King Henry I Street, Portsmouth PO1 2DY, UK. Jochen Müsseler worked as research assistant and teaching assistant in Cognitive Psychology and Psycholinguistics at the Universities of Bochum, Bielefeld, and Munich. Since 1996 he has been senior scientist at the Department for Cognition and Action at the Max Planck Institute for Psychological Research in Munich. His current research interests focus on the interface of perception and action, the cognitive representation of actions, the perception of space and time, and the attention mechanisms.